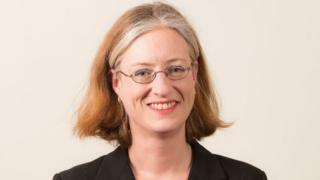 UKIP's team in the Welsh Assembly has shrunk to just three after one of its AMs quit the party, calling the Senedd group a sexist boys' club. Michelle Brown has become the fourth AM to leave the group since it entered the institution with seven in 2016. The North Wales AM said she could no longer stomach UKIP, attacking its leader Gerard Batten's association with far-right figure Tommy Robinson. UKIP said she should resign as an AM. The party alleged she was only quitting UKIP to avoid censure, alleging poor attendance. Assembly UKIP leader Gareth Bennett said her reasons were "bogus". Ms Brown's decision follows Caroline Jones, Mark Reckless and former AM Nathan Gill's exits from the group. Was Gareth Bennett happy Caroline Jones quit UKIP? In a statement Ms Brown said she had feared the "voice of reason" in the party was fading when she saw UKIP Wales leader Neil Hamilton and Mr Batten appearing on a stage with Tommy Robinson, the former leader of the English Defence League. She attacked individual UKIP politicians for pursuing "pet projects such as attacking Islam and abolishing the Welsh Assembly". "While it is clear that the UK needs a plan to defeat extremism and fundamentalism in all its forms and identities, I fear that the current UKIP leadership believes the best way to do that is to incubate and cultivate a rival fundamentalism," she said. Mr Batten appointed Mr Robinson as an adviser last year. The AM attacked Gareth Bennett's leadership of the group, saying he had made no effort to keep Caroline Jones in and was a key player in Mandy Jones' exclusion from it. Ms Jones replaced Mr Gill after he quit the Senedd. "The group does not function as a group but as a boys' club - it is not by chance that the group no longer has any female members," she said. She said the group had a "self-inflicted image as a sexist, self-interested 'Gentlemen's club'". "Over the last few months I have felt increasingly uncomfortable speaking and voting on behalf of the UKIP group, when I have lost all respect for the party's leadership on both sides of the border and have not been afforded any input into how the group should vote or the direction the group should take," she said. "As a genuine Brexiteer, I believe that decisions should be made as close to the people as possible, and I cannot remain in a group that is not only dysfunctional but is also determined to pursue a policy regarding devolution which runs counter to that principle." A UKIP source said the decision of Ms Brown to become an independent AM was "not a surprise". BBC Wales research found that Michelle Brown had not voted in nine out of 17 plenary sessions this year. Neil Hamilton, leader of UKIP Wales, said: "It seems she has jumped ship to avoid facing censure from the Group for her clear lack of commitment to her party and her constituents." Mr Bennett said: "This comes as no surprise as Michelle has been on the periphery of the UKIP group for some time, and has largely excluded herself from the group's business." The UKIP leader Gerard Batten said Mr Robinson is "not a member of the party, and he can only join if the members back his application in a national vote of the UKIP membership". "While we are disappointed to lose a member, Michelle Brown proved herself to be singularly ineffective as a member of the Welsh Assembly or in assisting UKIP build support in Wales," Mr Batten said. In response to the UKIP leader's claims, Ms Brown said she had felt "increasingly uncomfortable speaking and voting on behalf of the UKIP group" over the past few months, and had "lost all respect for the party's leadership on both sides of the border". She said she was "very often at the assembly, working and asking questions in the chamber but then not voting for the reason already stated, so it is utterly wrong to associate a voting record with attendance". "On one of the occasions, for example I was on a trip to the European Parliament with fellow AMs from all parties, on the External Affairs Committee, working on Brexit as I hoped the UKIP group would do," she said. The party has been beset by rows since it joined the assembly, and has seen two changes of leader. Mr Bennett, who is opposed to the existence of the Welsh Assembly, took the helm of the party last summer after a ballot of Welsh members. Three AMs is the minimum required to be funded as a party group, under assembly rules.